The Acarina, or Acari, are the mites and ticks. They are an order of Arachnids. Their fossil history goes back to the Devonian era. Most acarines are tiny: less than a millimetre. It is estimated that over 50,000 species have been described, but a million or more species may be currently living. The study of mites and ticks is called acarology. Acarines live in practically every habitat, and include aquatic (freshwater and sea water) and terrestrial species. They outnumber other arthropods in the soil and detritus. Many are parasitic, and they affect both vertebrates and invertebrates. Most parasitic forms are external parasites, while the free living forms are generally predators and may even be used to control undesirable arthropods. Others help to break down forest litter and dead organic matter such as skin cells. Others still are herbivorous and may damage crops. Damage to crops is perhaps the most costly economic effect of mites, especially by the spider mites and their relatives, earth mites, thread-footed mites and the gall and rust mites. Some parasitic forms affect humans and other mammals, causing damage by their feeding, and can even be vectors of diseases such as scrub typhus and rickettsia. A well-known effect of mites on humans is as an allergen which stimulates asthma. Predatory mites may be used in pest control and herbivorous mites used to attack weeds. A positive contribution of the Acari is their normal functioning in ecosystems, especially their roles in the decomposer subsystem. A hugely successful group with a large number of species. Mites are among the most diverse and successful of all the invertebrate groups, but because of their small size (most are microscopic) go largely unnoticed. They have exploited many habitats. Many live freely in the soil or water, but there are also a large number of species that live as parasites on plants, animals, and some that feed on mould (fungi). 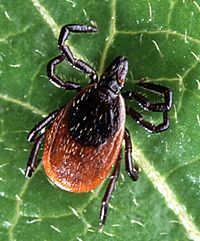 Ticks are blood-sucking ectoparasites, mostly of mammals and birds. They wait on grass or bushes, and jump onto passing animals. A number of birds specialise in picking them off larger animals: the Cattle Egret and the Oxpecker for example. They are quite serious pests, and can be hard to get rid of. 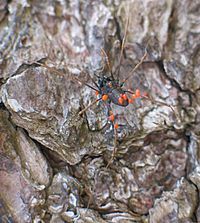 They are vectors, carrying diseases such as Lyme disease. Non identified acari from the plant's leaf. Microscopic image, manual z-stacking. Acarina Facts for Kids. Kiddle Encyclopedia.